We invite you to watch the Open Talks presented by Cooper Hewitt, National Design Museum at Pioneers of Change if you were there in person. How much space is needed to produce food for the entire population of Manhattan, including those who live there and those who visit? With current US production yields, this would require 150 times the area of Manhattan. With a combination of hydroponic farming to boost crop efficiency, organic farming for animals to increase quality and animal well-being, while maintaining minimum livestock surface areas as specified by Dutch regulations (US organic farming regulations do not specify minimum), the area needed for food production is reduced to 46 times Manhattan. 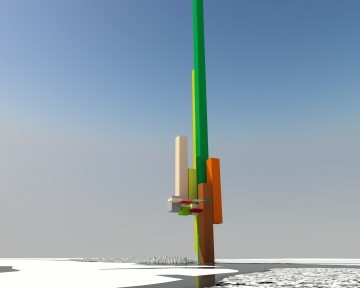 To grow all food for Manhattanites in one tower, a tower of 23 miles in height would be needed, including the food for animal production (or 8.7 miles tall without food). 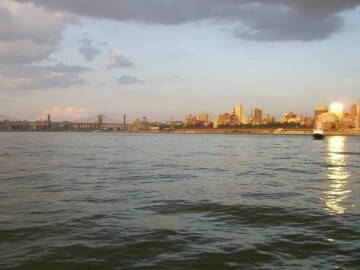 By distributing various ingredients over Governors Island in different towersâ€”cereal tower, chicken tower, fruit tower, fish towerâ€”a gigantic food city would appear next to Lady Liberty. Alternatively, distributing the towers over all the rooftops of Manhattan would result in a food layer of 656 feet on top of every building of the city. Food City investigates the influence of food on culture, on institutions and on the functioning of the city. A debate concerning the value of food, the romantic imagery of food production, innovative town farmers, and pigs in the city. An industrial estate near the centre of The Hague is envisioned as an urban pig farm, reconnecting citizens with meat production and reacting upon the demands of the consumers to learn more about the origin of their food. The farm could provide energy for the surrounding buildings and the animals could live in good conditions without being subject to long distance transport for butchering. With modern technology preventing odor nuisance, the pig farm technically could have neighbors such as a Prada outlet or offices. For one of the houses we asked Franck Bragigand to paint and furnish the inside in preparation for Open Talks that were to take place on the opening day. 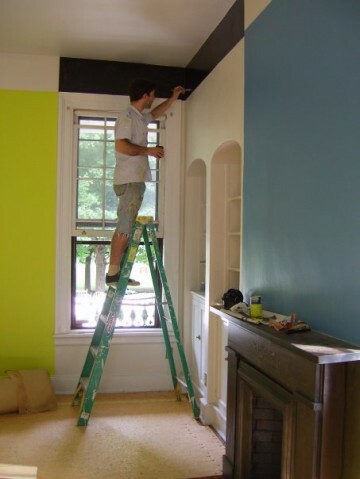 Franck has a great capacity to transform the world using only a coat of paint. Heâ€™ll cover anything, but never bring in something new. 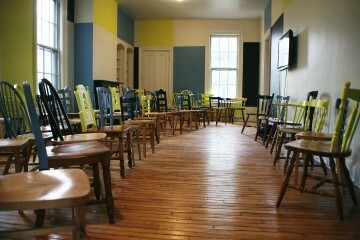 To seat the audience, used chairs were brought in from all over New York, and Franck had them painted by our team of volunteers. 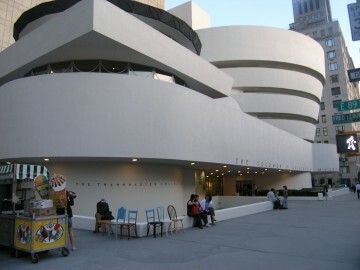 Open Talks took place, and after the event, Franck returned the newly painted chairs back to New York, sneaking them onto people’s front porches, neatly tucking them in front of the Guggenheim, or conveniently propping them in front of a public telephone in neighbourhoods from PSI and Guggenheim to the Bronx. If you were one of the lucky ones who found a chair and sat on it, or took it home, send us a photo to info@droog.com for publication. We’re sure Franck would want to know. These two kids certainly know how to spend a few moments of their Sunday afternoon. 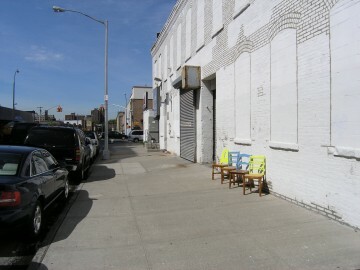 Here they are lounging at Bowery / Bouwerij with the tickle robot by Drissens & Verstappen. The crew sure looks more relaxed once all is said and done! Here they are, pleased that everything is packed and ready to leave the island. Thank you to all the volunteers! 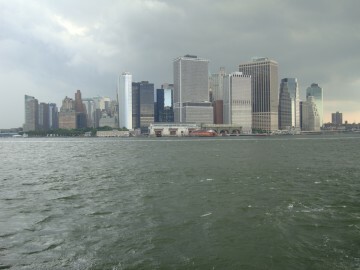 Last week in Manhattan, when the Art crowd jostled into a thousand openings in Chelsea, I sailed off to Governors Island for the inauguration of Pioneers of Change , a festival of Dutch Design, Architecture and Fashion. After a short crossing from the southern tip of Manhattan we landed on this strange island, with abandoned military and administrative buidings and ghost housing for the officers. The sky was grey, about to rain, and there was something a little sinister in the air, which suddenly made me fear of being taken into custodyÂ and held in an endless quarantine. Eleven identical former officers houses were the scene of installations and workshops by Platform 21. 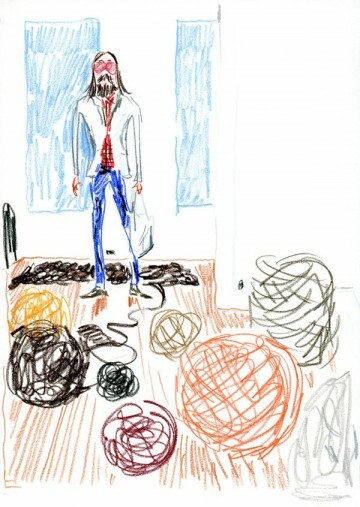 It was funny to think of the regulated life that had probably ruled those rooms where Christien Meindertsmaâ€™s giant knitted works now lay on the wooden floor. Repairing was the main theme. 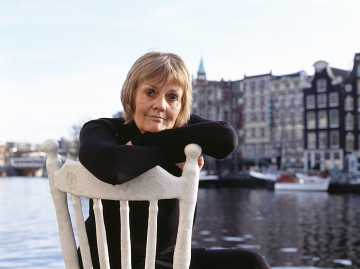 In one of the housesâ€™ kitchen, a calm blond woman was mending plates she had purposely broken by gluing slightly misplaced parts in an artful arrangement. 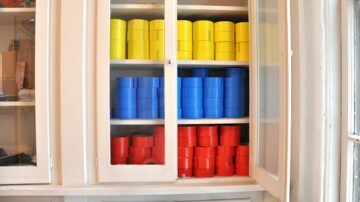 In another room, a young artist was selling repair kits forÂ damaged walls with yellow, red, and blue tapes to be applied in Mondrian patterns. 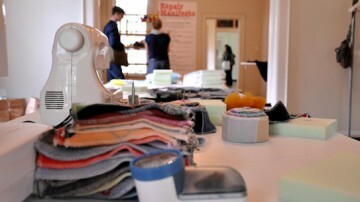 But best repairing kit was a wool filler for mending holes in textiles, by designer Heleen Klopper. I immediately used it to fix the elbows of my old, worn-out jacket from the Sydney thrift shop. 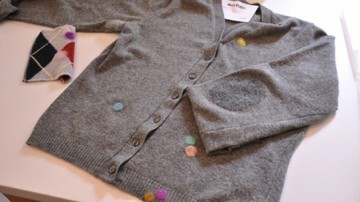 And then I repaired a sweater I had brought with me. 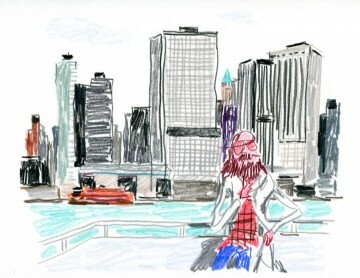 All images and text by The Unknown Hipster (he is revealing himself to be Jean-Philippe Delhomme) as posted here. “I can best answer this question from a personal point of view. I was invited to collaborate with the fashion design collective Painted, even though (or perhaps because) I am a theater maker and director. To collaborate in this new context is very challenging for me. My curiosity is driven by looking for the source of a gesture and the meaning it receives when designing and making things. Itâ€™s a dialogue. Working with two fashion designers I see how they make images and forms, while I tend to make gestures and movements that are not necessarily fixed in a form. For me form is temporary, and intended to let life pass through it. 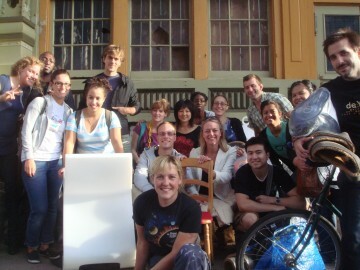 I can feel how this new collaboration enriches Painted and the things we make and do. And certainly, it enriches me. Sweepers Clock by Maarten Baas. 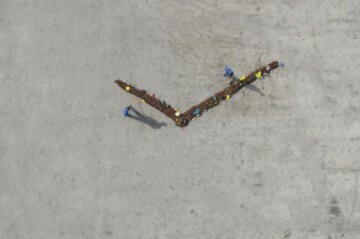 A clock in which some people are making the hands of a clock, by sweeping garbage all day long. “I enjoyed Platform21=Repairing because of the very poetic yet concrete and realistic examples of repairing, because of the possibility to do it yourself in the house, because of the manifesto that links the activities, and because of the ‘designers’ who demonstrated their ideas and products themselves. Their spirit and personal approach was inspiring. 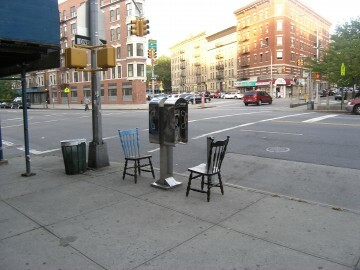 If you find chairs like these laying around the streets of New York, take them! 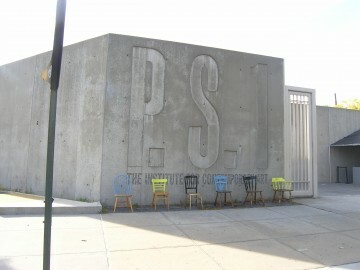 60 used chairs collected from all around New York for Rhode IslandÂ / Roode Eylandt will be redistributed after the closing of Pioneers of Change. They were painted by Franck Bragigand, and his crew (see images below). Keep your eyes peeled. Whether you love or can`t stand it, a robot that tickles sure is intriguing. People are lining up for stroking sessions at Bowery / Bouwerij , a house where you will temporarily lose access to all your mobile telecommunication devices. Ah, the luxury of silence and care. Just a reminder that this is your last chance to see it all in person. 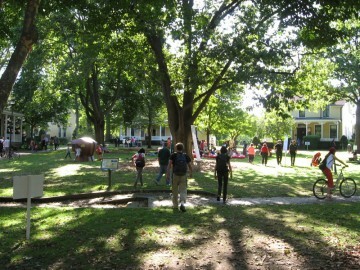 Pioneers of Change is open for one last weekend and the weather is going to be great! 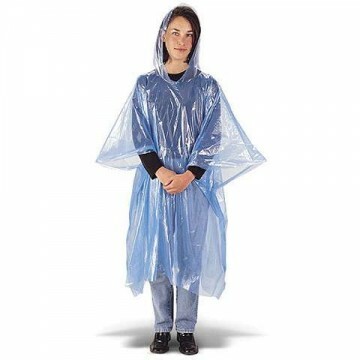 No ponchos necessary. 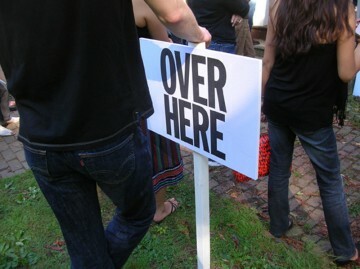 Over Here / Over There graphic sign system by Experimental Jetset. 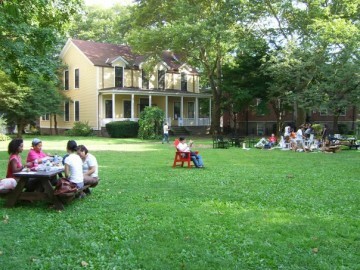 The Greenwhich / Greenwijck lawn. 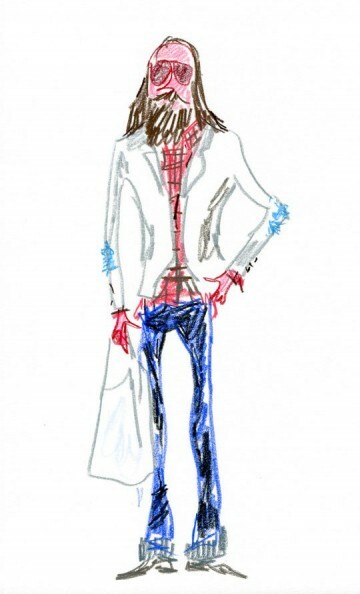 Heading from Governors Island to Greene Street, two participants from Pioneers of Change, artist Franck Bragigand and fashion designer Desiree Hammen (Painted) will lead a pop up workshop at Droog New York for four hours only. You are all invited. Juanita and Jessica Growing Thunder, Saskia van Drimmelen and Erzsi Pennings beading on the terrace in front of Coney Island / Conyne Eylandt. Juanita is often accompanied by dragonflies, even on Governors Island! She is beeding a beautiful one on the needlepoint lace detail made by Rumjana Rakovska in Bulgaria. 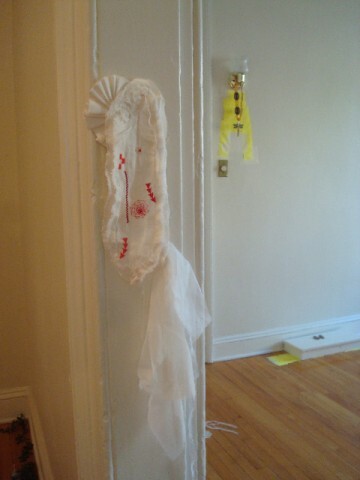 A doorway doily to enjoy while watching the film of Painted Garden. 2012Architecten filled Flushing / Vlissingen with secondhand ’super-use’ building supplies collected from all over New York and made a Harvest Map of materials available in New York. 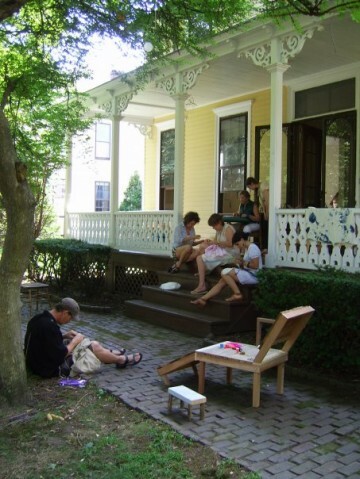 Ok, so this post is a few days late: Open Talks took place last Thursday, Sept 10th against the backdrop of freshly painted Rhode Island / Roode Eylandt house by Franck Bragigand. Marije Vogelzang, Christien Meindertsma, Laurene Boym, Mathilda McQuaid and Amale Andraos led a discussion on new notions of luxury. 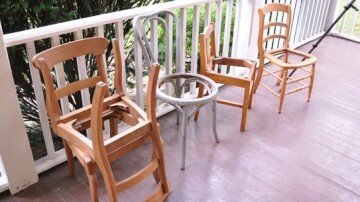 Something other than high quality marble or a limited edition chair, transparency, care and fresh air all came up. For a review, visit Reports from the Field. 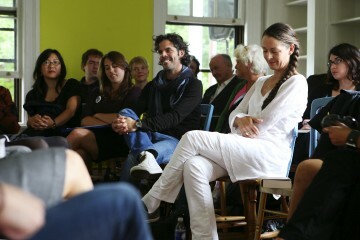 The talks were presented in collaboration with Cooper-Hewitt, National Design Museum in New York. 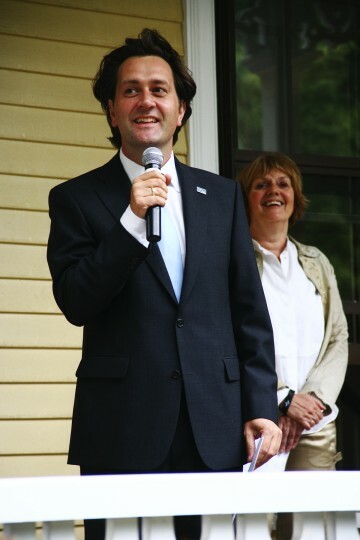 Opening words by Frank Heemskerk, Dutch Minister for Foreign Trade and Renny Ramakers, curator of Pioneers of Change. You thought Pioneers of Change was all about relaxing, but actually, they’ll put you to work at HarlemÂ / Haarlem. Platform21 favors repair over throw-away or recycling, and their notion of repair doesn’t just mean fixing it, but also creating a new value. See two reviews on Eat me daily and Treehugger. All sorts of goodies to repair and repair with. 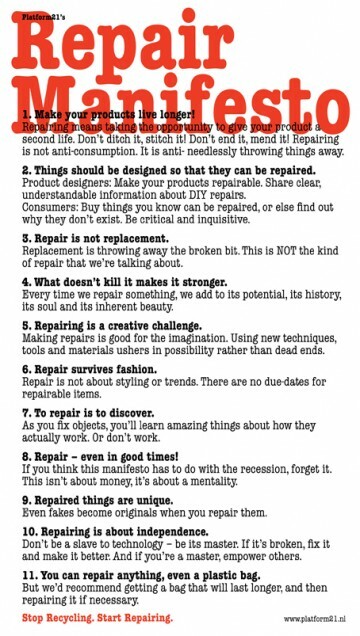 Repair Manifesto by Platform21, downloaded over one million times from their site. It was a very relaxed visit by Crown Prince Willem-Alexander and Princess MÃ¡xima on Saturday on the island. Princess MÃ¡xima receives a crafted gift from Saskia van Drimmelen (Painted) and Pascale Gatzen (IDC fashion, Parsons The New School for Design) at Coney Island / Conyne Eylandt. Princess MÃ¡xima meets one of the servers at Go Slow cafe by Droog with Marije Vogelzang, sloom.org (Rianne Makkink and Herman Verkerk) and Hansje van Halem. A slow meal at BloomingdaleÂ / Bloemendaal. 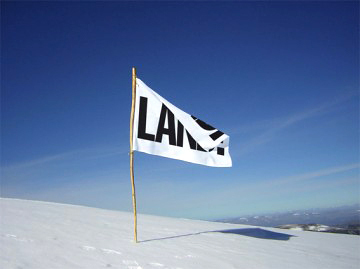 “Luxury is really about scarcity,” declares Ramakers. “But what’s scarce? Care, silence, fresh air, slowness. That’s the spirit of Droog.”Each of the eleven houses is taken over by one design group–ranging from one designer who knits rugs using four-foot knitting needles, to a Dutch collective that’s teaching visitors to repair old clothes and broken plates with clever techniques that lend a quirky beauty. 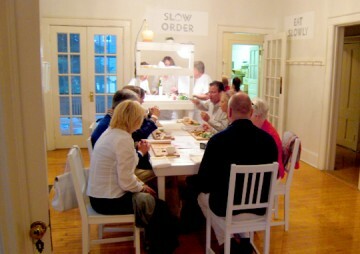 For aÂ familiar yet new eating experience visit Bloomingale / Bloemendaal where you’ll find the Go Slow Cafe by Droog with Marije Vogelzang, sloom.org (Rianne Makkink and Herman Verkerk) and Hansje van Halem. 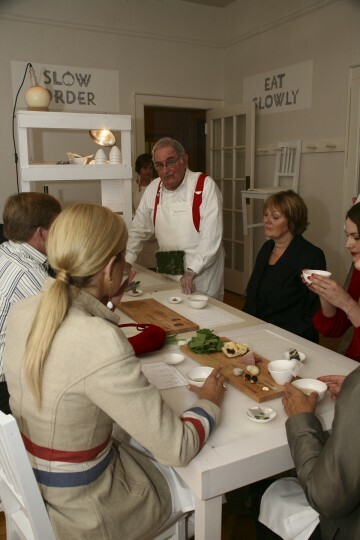 “The serene, leafy-green alternate universe that is Governors Island… is an absolutely ideal location for the Go Slow Cafe: the island itself is a sort of sedative, slipping you into a dream-like state the second you set foot on it. The Go Slow Cafe capitalizes on that, itself designed and engineered to calm â€” on two levels, you’re disconnected from the hustle of New York City. You’re asked to give in to the entire concept, to un-hurry, and therein find a true indulgence, a luxury, of slowness,” writes Raphael Brion. Slow yet attentive service by elderly New Yorkers. 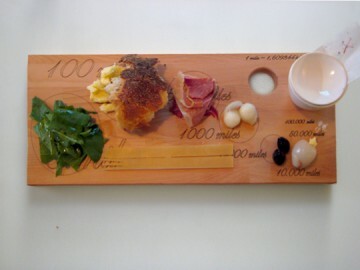 Food portions are determined by the distance travelled to the cafe. I’m sure you have one kicking around for those adventures you knew you’d have one day. 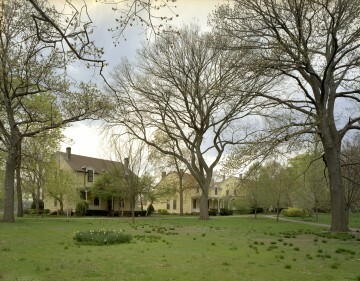 Now’s the time to sport your poncho and explore Governors Island, yes, even in the rain. Available at many bargain stores throughout Manhattan. 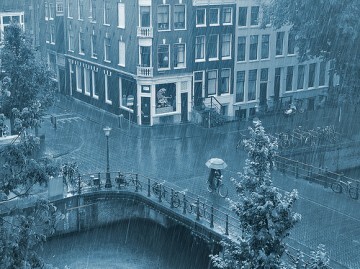 Has it ever stopped the Dutch? Today is the opening day! 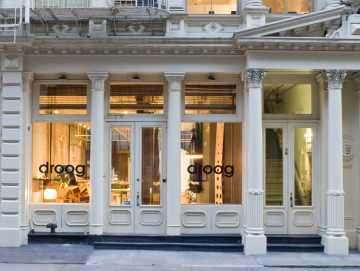 Send us your thoughts and snapshots to agata@droog.com for uploading on this site. A dish-washing brush made out of a brightly coloured foam ball clasped between the arms of a steel fork, which doesn’t need to be thrown away after a few uses. 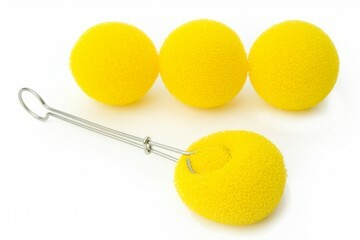 You can also use the spare sponges to juggle. Ears are the only parts of the body that keep growing as long as you live. This cup available in several colors is unbreakable. 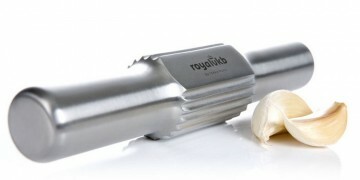 Just crush the garlic clove with the flat side and spread out the contents by rolling over it. Brilliant. 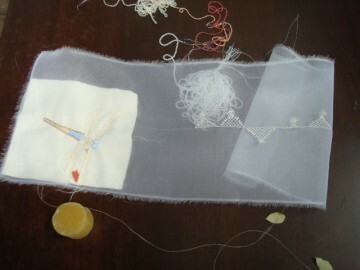 100% cotton tea towels with insect patters made by Studio Job at the Textile Museum in Tilburg. The store interior designed by Marcel Schmalgemeijer. 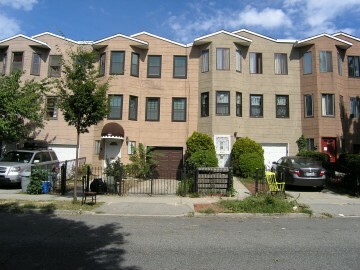 Visit the Bushwick / Boswijck house to catch screenings of films that explore urban farming, even right in New York. Footprint Manhattan (study, 2009) by The Why Factory (T?F), MVRDV and Stroom investigates how much space is needed to produce food for the entire population of Manhattan, including dwellers and visitors. With current US production yields, this would require 150 times the area of Manhattan. The image above is one visualization of this spatial requirement and gives a good idea of the enormous impact food production has on space. Visit the house to see more configurations that keep the demand within the boundaries of Manhattan. 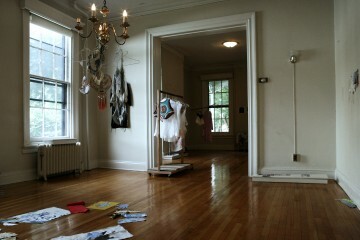 Hereâ€™s a snapshot of the work in progress just before the opening. 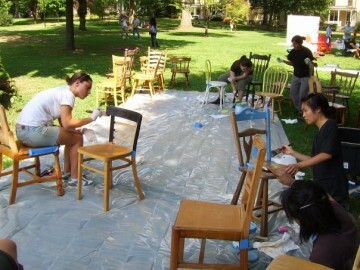 and everyone else is painting used chairs brought in from all over New York outside. On the porch of Coney Island / Conyne Eylandt: preparations by Painted in collaboration with Pascale Gatzen and IDC fashion students of Parsons The New School for Design in New York, Native American bead masters Joyce, Juanita and Jessica Growing Thunder, and local lace makersâ€¦ the list is long! Passer-bys also are joining in. 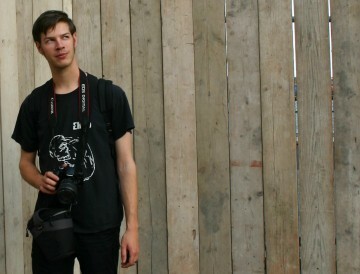 Jos from 2012Architects in front of the Flushing / Vlissingen house. Writing his blog entry, I hope. When we say new collaborations, we mean children too! 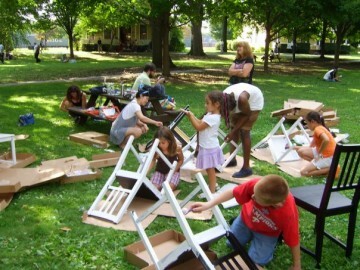 Here they are painting chairs for the Go Slow CafÃ© at Bloomingdale / Bloemendaal. Thank you moms and dads! 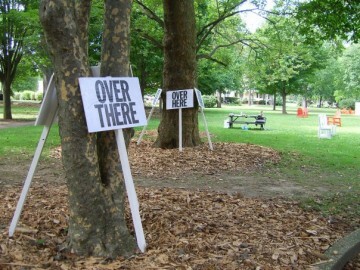 Over Here / Over There signs by Experimental Jetset just before being staked into the Greenwhich / Greenwijck lawn. Sure seems leisurely. Not the typical atmosphere just before an opening. It definitely was an experience racing down the highway with the u-haul, filled up with our recently purchased goods, trying to make the ferry. Once on the island, you enter another world of peaceful quiet parks, Victorian houses and blue shirt security guards. 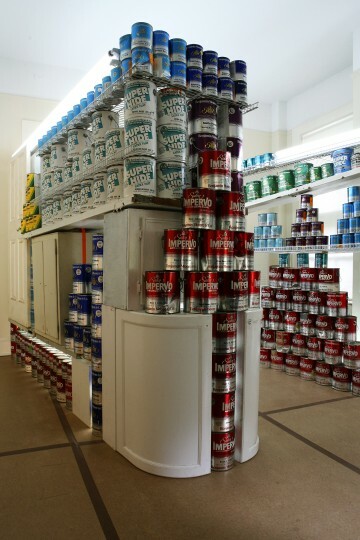 On Friday, Floris, a New York based sustainability expert and I started building, figuring out the construction details and playing with our 700 cans of paint. Things went well, I’m happy and definitely exited about the festival, the views, and of course, NYC by night ;-) More to follow! 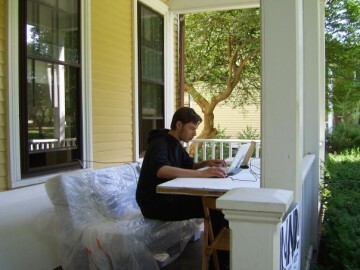 I am writing this blog while working on the last preparations for Pioneers of Change. These last moments are, as usual, full of tensions. We have disagreements with the graphic designers, who think that we are making too many changes in the texts, with the risk of destroying their precise design. 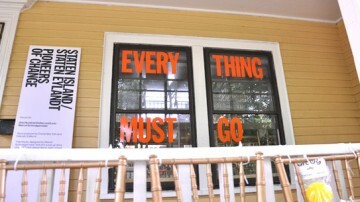 They are right, with so many parties involved in the process and people on holidays, changes after changes came. We asked the designer of the VIP room, which is furnished with Droog pieces,Â to change his beautiful design. The balloons he envisioned hanging from the ceiling turned out to be not a good idea because we just heard from one of our team members that she is allergic to latex. 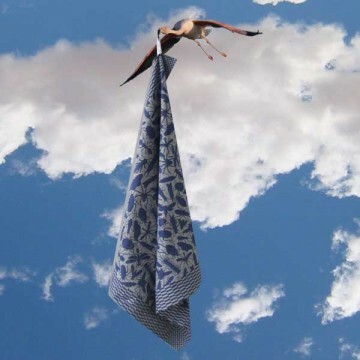 Yesterday we rejected the designerâ€™s alternative, again very charming, but not environmentally sound. We feel we are driving him crazy, but we are convinced that he will come with another beautiful solution. 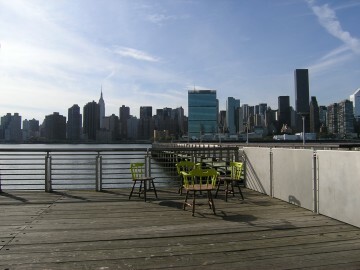 We are negotiating with New York catering companies because we have the feeling that they are overcharging us. We have to arrange extra toilets because we expect 700 people to attend our VIP opening. Security rules oblige us to fence our space during the opening and have the audience checked for their age. Now we have to design wristbands that they can wear as proof of being over 21. Thatâ€™s all because we are serving delicious cocktails. Our two sweet interns, we call them Tom & Jerry, are stuffing the invitations in the envelopes while watching a movie. 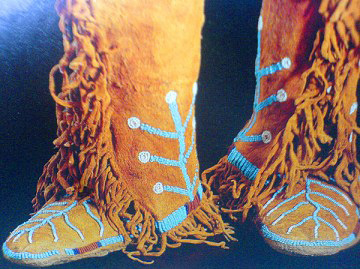 I hope that can be sent out today because they proceed very slowly. Tomorrow the last shipment will leave the country and the team will fly over next week, surely to what will be an exciting event. And at the other side of the ocean our New York team is busy having the houses cleaned and preparing all electrical matters. 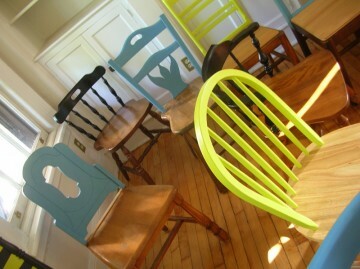 Sixty different secondhand chairs for the Open Talks house are waiting to be painted. 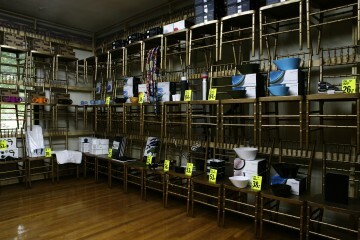 We really did not want to ship a lot of stuff and rely as much as possible on old furniture found in New York. I was a bit worried about being able to find so many of them. But our New York producer did! 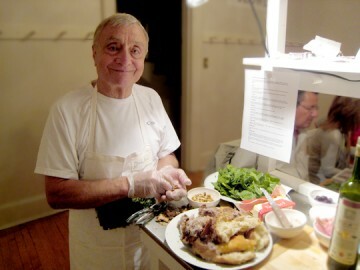 Our New York team also found 15 elderly people, eager to serve food and drinks in our Go Slow house. A tough job to spot elderly people living in elderly peoplesâ€™ homes that actually look like elderly people are supposed to look and not like those botoxed and face-lifted old girls so common in the U.S.Â But we have got them! And they will serve you slowly but attentively. Itâ€™s no wonder two weeks before the event, that the moment is full of scary excitement, when bringing together so many parties and bridging two continents. 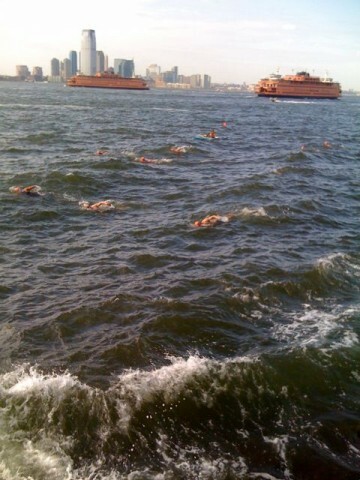 I canâ€™t wait to be on Governors Island, to see the results and to hear all the reactions of the visitors. Visit by their Royal Highnesses the Prince of Orange and Princess of the Netherlands;Â Crown Prince Willem-Alexander and Princess MÃ¡xima will visit us atÂ Pioneers of Change on Saturday, September 12. 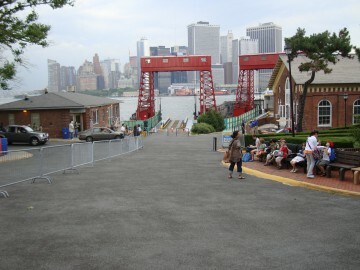 Governors Island has its own blog (they also can be followed on twitter). They have placed an announcement for Pioneers of Change; read it here. Some further anouncements: onÂ NY Mag, onÂ NBC NY, onÂ National Geographic,Â on Core77, on Dexigner, on Dwell, on The Scout, on Interior Design.